and all pedestrian Road Safety messages. A black cat turns yellow, a girl appears behind a car, traffic lights magically change, the Magic Rope, Stop, Look, Listen, Always Be Careful. Magically woven together to make a powerful fun but memorable presentation. "It was a pleasure to have you here! All the children - from the wriggly Receptions to the hard-to-impress Year 6s - thoroughly enjoyed every minute of your shows and really took on board your safety messages. (Feel free to use that as a quote / recommendation!) I am sure we will invite you back some time in the future. Thanks once again, "
Road Safety Key Stage 1. If we can get the safety massage into children under 6 it stays with then forever and statistics have shown that those who have been taught at an early age have less accidents when they get older. The idea of this show is get the children to STOP before they cross. If we can do this one simple thing Half the pedestrian accidents would never happen. Road Safety Key Stage 2. The peak age for anybody getting knocked over is 12 and twice as many boys as girls. This is the age they are out on their own, this show is on decision making and more about the dangers of roads and re emphasising the messages that have been taught in the past. 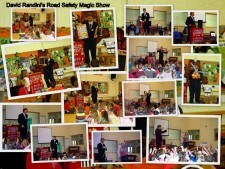 "During NRSW David delivered 8 shows to over nearly 2,500 primary school children, and he was a resounding success." Please click on Road Safety In Depth for my Road Safety Guide for Teachers and Road Safaty professionals.